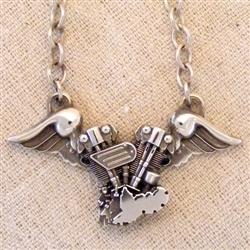 So, we took the anatomically correct knucklehead motor that we built for the ring, and added some stylized wings to create this pendant. It hangs from the top of the wings from a heavy chain, and the width is 63.5 mm wide x 32 mm high. Sterling silver. Limited edition of 20. Design Notes: The model of the motor of this ring was built from the 1936 blueprints of a 61 inch knucklehead motor. I built a full 3d model of the motor even though the back would not be visible, this ensures that the proportions are correct, plus it is more fun to build.